1. What Is Personal Capital? You get comprehensive spending, saving, and investment performance information in a user-friendly interface. It’s fast and easy to sign up. Fast data collection is next. The Personal Capital financial software will simplify your financial life. I understand that you need to know more, so here is my personal review of the platform. 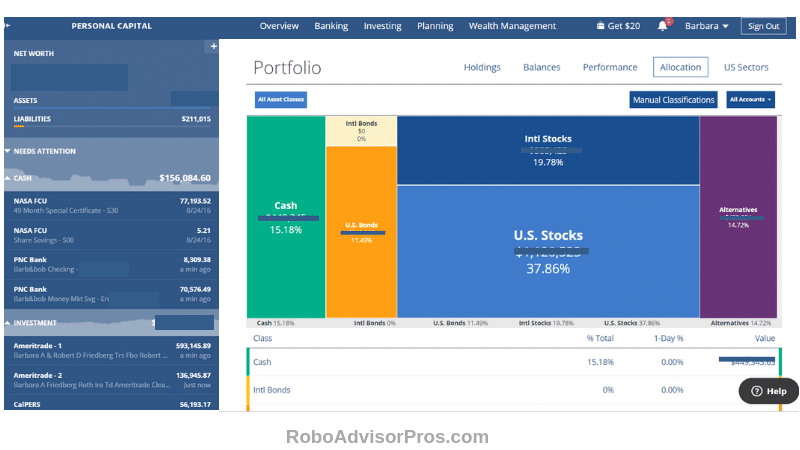 Here’s what you need to know about this comprehensive robo-advisor platform. Personal Capital takes all of your financial accounts and gives you information and direction about how to best allocate your money and investments to yield the greatest long term financial outcome. More than 1.8 million people use Personal Capital to track over $7.5 billion in assets. The platform works seamlessly. To begin the process, connect all of your accounts with the bank-level security encryption. There’s room in the platform for mortgage, credit cards, bank accounts, investment accounts, 401(k), IRA’s and most other types of financial accounts. This process is surprisingly quick. You can also add accounts manually. As soon as the accounts are connected to the Personal Capital program, the free service gives you personalized financial information about; budgeting, spending, saving, investing, asset allocation and even tax loss harvesting. You want a 3600 view of your complete financial picture; bills, income, debt, investments and more. You’re a DIY investor who likes control of your finances. You have many investments across various accounts. You want to drill down into free retirement planning calculations. You’re interested in planning for Junior’s college expenses. You want a continuously updated record of income versus spending and a comparison with the previous month. You might want to speak with an experienced financial advisor. If you answered yes to at least one item, you must sign up for a free Personal Capital Account. Not only do you receive a picture of your current financial situation, but you get help managing your investments and figuring out what you’re doing well and what can be improved. The Personal Capital app android and iOs bring your finances to your fingertips. You’ll receive tremendous financial data and information for a few minutes of set up time. To begin, you complete 2 screens. Sign-up time; less than a minute. From there you input your account information. A word about security here; security is their top priority. They have bank-level encryption to keep personal information, account, and money safe. Additionally, both of this website’s owners have accounts with Personal Capital. This section is so quick and easy, I was shocked. I was prepared for hours of anxiety and difficulty linking my investment and banking accounts to the program, but it was fast and easy. I’ve got a complicated financial situation and my accounts linked within minutes. To quickly link your accounts, fill in the name of your financial institution. First, I started with a TD Ameritrade Account. Next, for each account enter your account log in information – USERID and Password. Remember; Personal Capital has bank-level encrypted security. If you use any bank or investment broker apps, then you should feel comfortable with this platform. This linking screen populates fast, and then you’re ready to link your next account. Finally, repeat these steps until all of your accounts are linked. The number of accounts you have will determine how long it takes to sign up. Data collection sign-up time; less than one minute per account. Now, you’re ready to enjoy the broad range of saving, spending, budgeting, investing and analysis tools. The Sophisticated Personal Capital Financial Management Software is free. The drill down into all aspects of your money life is ideal. The insights and information about your spending, saving, and information is invaluable, and the cost is free. The idea behind Personal Capital is that once your financial life is on the right track, with information at your fingertips, you can go about the process of living. 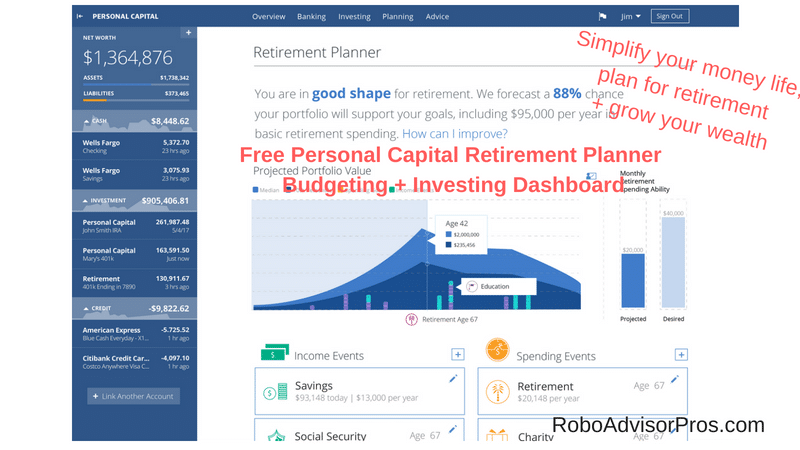 Overview Digital investment management robo-advisor in concert with human financial advisors. Minimum Investment Amount Zero minimum for access to free investment management tools. $100,000 minimum for managed accounts. Fee Structure 0.89% for investments of $1M to $2.9M. Fees decline as assets increase. Low 0.49% for accounts over $10 M.
Top Features For paid users: Certified Financial Planners, full financial plan, individual stocks, diverse asset classes + tax-loss harvesting. Free investment + retirement management tools for all. Free Services The most comprehensive suite of financial planning tools including cash management, investing + retirement planning tools. Contact & Investing Advice 24/7 call + email access. Phone, video & chat with financial advisors (for paid users). Investment Funds Individual stocks, low fee bond + alternative asset ETFs. Individual bonds for accounts +$1M. Accounts Available Individual & joint investment accounts. Roth, traditional, SEP & rollover IRAs. Trusts. Once you’ve input your data, you have access to a treasure trove of graphs, charts, and invaluable financial information. Check on and analyze your investments. 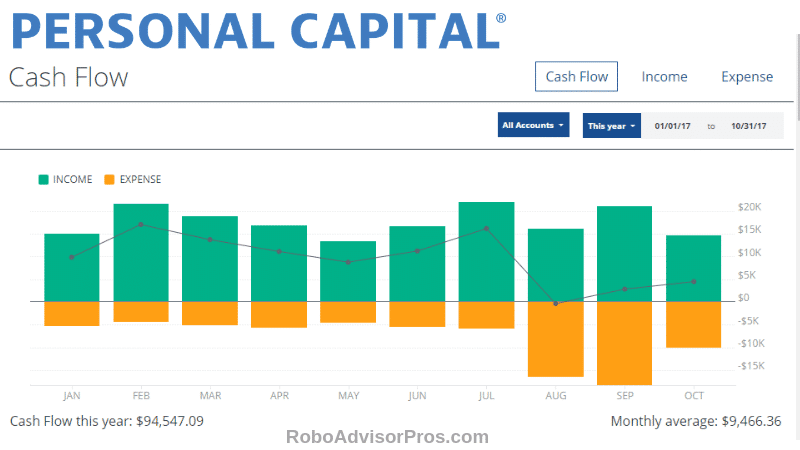 Now that you understand the overview and account set up let’s look at the free Personal Capital Dashboard review pros and cons. Free spending, saving and investment tracking and reports. Great retirement check up tool. Very easy and quick to set up, even with multiple accounts. As soon as account inputs are complete, you can view your account data in the outstanding overview charts and graphs. Had a great introductory conversation with a financial advisor (no pressure to use paid service). Great Personal Capital Dashboard interface. Easy to use Personal Capital apps. A few accounts populated twice. I got rid of the duplicates quickly by clicking the edit pencil and then the remove option. One of my linked IRA accounts wasn’t downloaded. It required a quick call to customer service to get the account populated. They send regular update emails about spending and income. In exchange for downloading the free financial software, you will receive a phone call (or two) from Personal Capital requesting that you sign up for the paid investment management offering. (You’ll learn more about this below). Personal Capital software and financial management starts with knowing your complete financial picture. One of the most important financial goals is to grow your net worth over time and the Personal Capital dashboard keeps your net worth front and center. As one of the most important long term metrics for financial success – keep your net worth growing and the rest of your financial life will fall into place. I’ve set net worth and financial goals my entire life, and with decades in the investment markets, the financial growth is gratifying. After linking your accounts, the Personal Capital dashboard is up and your net worth listed both graphically and with a dollar amount. You even get your home’s Zillow current value. The net worth graph shows how your complete financial picture progresses over time. Kind of like dieting, if you don’t measure where you are when you start, you won’t know when you reach your goal. The same is true of tracking your net worth. Your financial plan starts with knowing how much money you have now, how much is coming in and the amount that you’re spending. 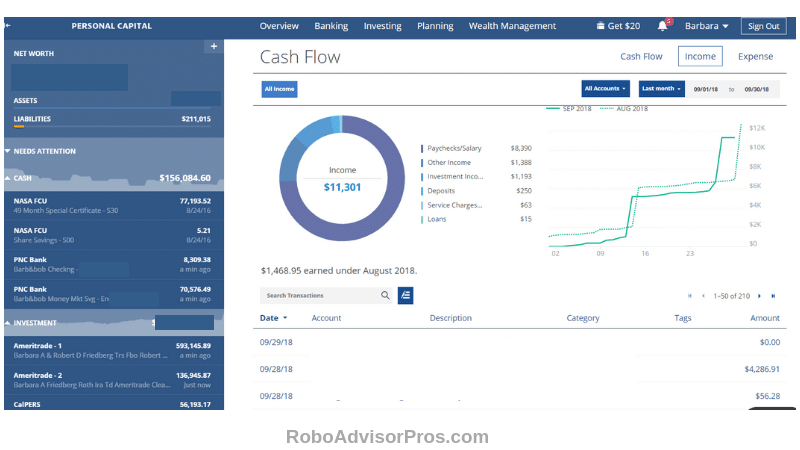 The Cash Flow section of the Personal Capital investing tools streamlines this segment of your life with a detailed dashboard. Cash flow is your day-to-day, week-to-week money management compass. With cash flow data, you’ve got the tools to see where your money is going and whether you need to make changes or not. Personal Capital budgeting tools help you see exactly how you spend your income. The cash flow graph details how much money is left after subtracting spending from income. You can choose the time period, within two years. On the separate income screen you can see just where your income is coming from and how it’s changing over time. The income screen highlights where your money is coming from. The bar allows you to compare your monthly income with the average. You can also adjust the view to highlight a variety of time periods. By analyzing your income, you can assess your incomes sources and use that data to consider how to improve your income profile. This image shows a positive month, with more income than spending. That’s good. If you’re having a month with more spending than income, you can’t hide from it. Click on any section, and zoom in to see a detailed view. Click on income and see all of your income sources. On the expense screen you get your detailed spending analysis. This ‘in your face’ cash flow picture gives you ready access to the viability of your lifestyle choices. Go to spending and find out exactly where your money is going. I remember the first time I noticed how much our family was spending on dining out, it was a real eye-opener. It caused us to sit down and figure out if the money we spent at the restaurants was worth the damper it was placing on our financial growth. Interested in analyzing your spending more? Personal Capital categorizes each purchase and you can drill down to view the date and merchant. With all the time demands, it’s tough to stay on top of bills due dates and when you made your last payment. Click on the Bills tab under Banking and Personal Capital shows you when bills are due, the minimum payment and total amount outstanding. So far, we’ve talked about the cash flow and net worth capabilities of Personal Capital. But the beauty of the platform is that it seamlessly integrates your short-term income and expenses with a comprehensive investing platform. This holistic financial view is priceless, and this Personal Capital Software is free. Now, let’s investigate the free investment tools. Being able to see all of your investment accounts is ideal. After inputting all of your information, you have a 360o view of your retirement, bank, and brokerage accounts. You can integrate that CD you have with a credit union with your prior 401(k) account, a Roth IRA, discount brokerage account and any other type of financial account that you have. This allows you to splice individual cash, stock, bond, mutual fund, ETF and any other financial holdings into a total picture. Investment Check Up offers recommendations to improve returns. The investment check-up offers priceless tools. 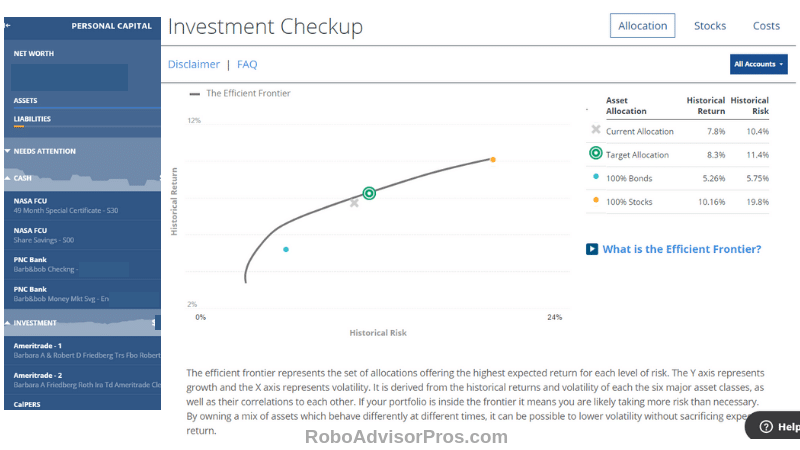 The overriding question that the investment check-up answers is “Could your portfolio give you greater returns for a reasonable risk level?” The program answers this question by comparing your current asset allocation to the recommended target. Personal Capital offers suggestions to improve your returns, as well. 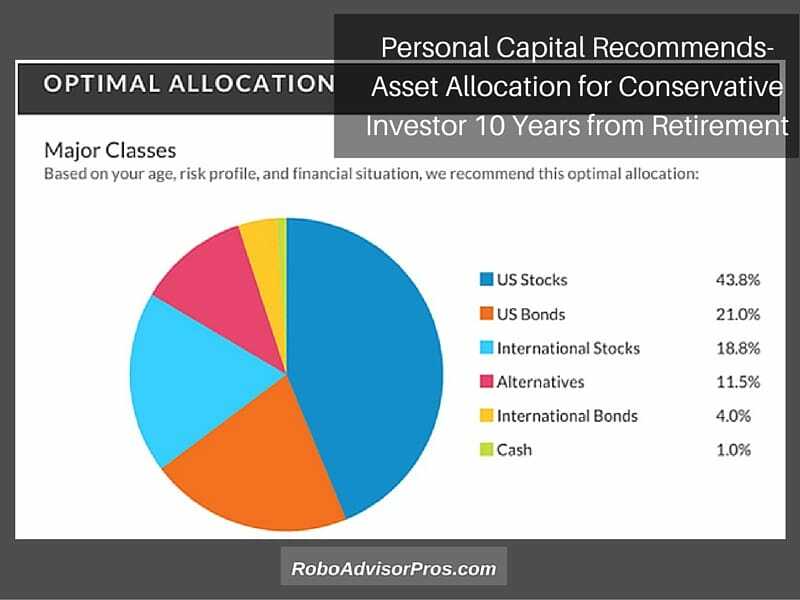 Personal Capital reviews my asset allocation and offers recommendations to improve returns in the Investment Check up. Here’s my current asset allocation. My portfolio holds 15% in cash, which is more than Personal Capital recommends. I like holding a lot of cash, when the stock market is highly valued, so that when stocks go on sale, I can buy at lower prices. Based on your risk preferences and expected retirement date Personal Capital creates an asset allocation for you. You get a personalized asset mix, with the greatest return for the least amount of risk. This portfolio leans towards the aggressive side. When comparing the current allocation with the suggested target, in my portfolio there’s lots more cash, than recommended as well as fewer international stocks and bonds than recommended. Personal Capital recommends that I hold only 1% in cash, 4% in international bonds, 21% in U.S. bonds, 19.2% in international stocks (that’s about what I have), 44.6% in U.S. stocks, and 10.3% in alternatives. The major distinction in the recommended portfolio and my own is in boosting stock and bond allocations and cutting back on cash. Personal capital also explains the rationale for their recommendation and suggests that I can increase my portfolio value by $100,000 at retirement. There’s also an awesome slider that allows me to view various scenario projections for differing asset allocation mixes from more conservative to more aggressive. In the next graph from the Personal Capital investment tools section you can see the interaction between risk and return of the sample portfolio versus the targeted. Personal Capital uses Modern Portfolio Theory (and has its founder, Harry Markowitz, on their investment committee). The curve or efficient frontier represents the interaction between the portfolio’s risk and return with any portfolio which lies on the line representing the greatest return level for the amount of risk desired. If you’re willing to take on greater risk for the possibility of higher returns, then your investments will include more stocks and will be further to the right, on the efficient frontier. Comparing my current allocation with the target, you’ll see that the expected return is 7.8% with a risk level of 10.4%. If I switched to the recommended allocation, Personal Capital projects that I could increase my potential return to 8.3% with a risk level of 11.4%. Yet, as I mentioned before, I have a reason to maintain my existing asset allocation, and access to 15% cash. I really appreciated the FAQ at the end of the check-up. The list of questions and answers is great if you have any lingering concerns about how Personal Capital comes up with its results. The company explains that “The Investment Checkup” is limited to the data you have aggregated and the profile information you have entered.” In other words, the analysis is only as good as the inputs. It’s also important to realize, these are projections, and are the returns aren’t guaranteed. Are you wondering if you’re on the correct trajectory to meet your retirement goals? The retirement planner gives you the answer. The calculator tells you best and worst case retirement scenarios. It shows how much monthly spending your current portfolio will allow throughout retirement. If you’re out of whack and your spending is projected to surpass your income, you’ve got time and tools to adjust. This is a sample image of a family that’s done its retirement planning correctly. The consumer desires $13,000 per month spending yet has the ability to spend more, without running out of money. This retirement fee analyzer calculator lists the fees you’re currently paying for each of your funds. You can investigate the bite that fees consume from your total returns. Even the lowest account fees can add up over time. When Personal Capital analyzed my portfolio it showed that my average expenses were a rock bottom 0.22% as compared to the benchmark portfolio fees of 0.50%. Yet, despite comparatively low expense, the fees still detract from total returns. Since Personal Capital uses individual stocks, there are no annual fees for individual stock ownership. You’ll only pay for the Personal Capital portfolio management fee. The data overview and integration is phenomenal. 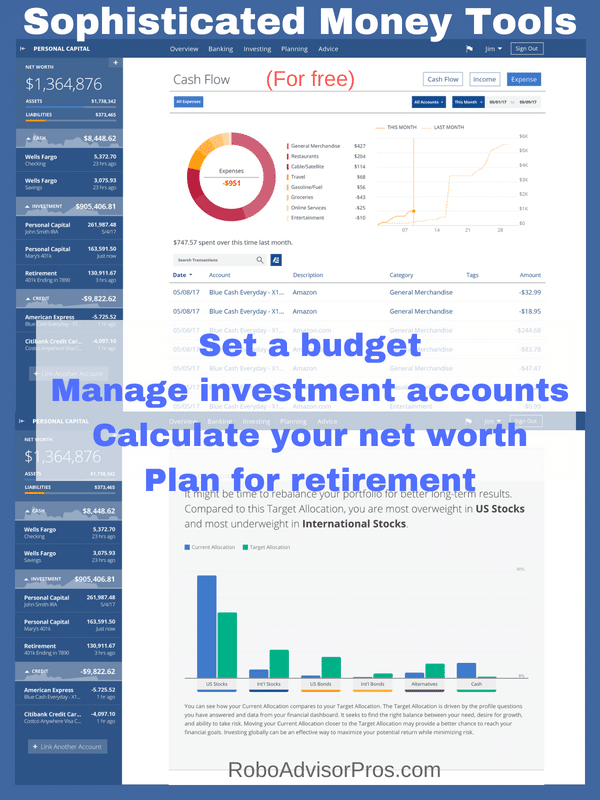 It’s helpful to view net worth, income, expenses, and investments with the push of a button. 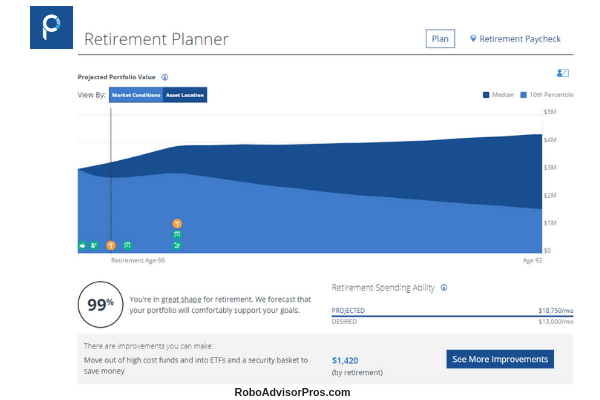 The retirement analyzer is a superb tool, as is the retirement fee analyzer. The drill down into sectors and detailed aspects of your portfolio is similar to the Morningstar x-ray tool and is a great way to uncover holes in your diversification strategy. The You IndexTM allows you to compare your investments against various benchmarks. For example, after a market drop the S&P fell -3.19%, while my portfolio only dropped -1.9%, due to its conservative allocation. Good Personal Capital App, mobile and tablet access. As the Personal Capital financial and investment software is free and set up is quick, it’s worth a try. Their assumptions are a bit aggressive for my taste, even for the moderate portfolio. The investment check-up, using historical assumptions doesn’t jive with my personal preference of capital preservation over growth. Maybe if I indicated a desire for a more conservative portfolio, then my results would have been more in line with my preferences. The historical reports only go back two years. For more extensive reporting capabilities you might add Quicken to your investment management tool kit. So far we’ve covered the rich offerings of the Personal Capital technology-assisted platform. From cash flow, investing, and retirement there are a wealth of free resources. 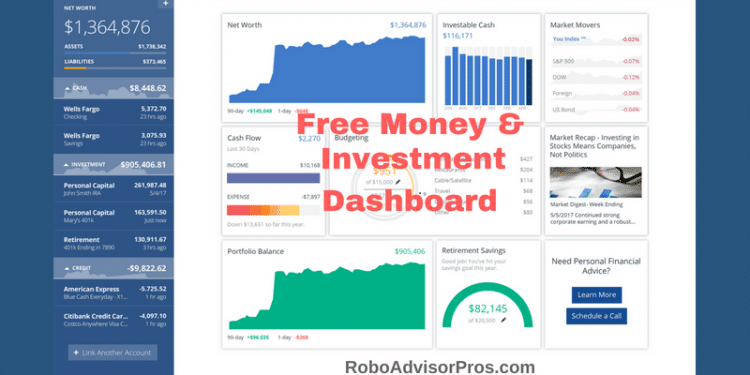 The easy setup and robust dashboard make this robo-advisor a must for your financial and investment management-whether you use Quicken, Mint or another system. Next, learn how the dedicated Personal Capital Advisors work for you. I had a productive and informative meeting with a financial advisor where I received an analysis of my personal investment portfolio. Here’s what to expect if you engage Personal Capital to manage some or all of your assets. You’ll also learn about the fee structure and corporate investment philosophy. The Dynamic Portfolio Allocation personalized investment strategy is based upon your goals and complete financial picture, including assets not managed by Personal Capital. As your life evolves and market conditions change, so does your allocation. I told my advisor that I was exploring the site to give a thorough and comprehensive review of Personal Capital including the free investment management tools and the Personal Capital Advisors offering. My advisor was cordial, helpful, and knowledgeable. He asked if I would like him to prepare a Personalized Investment Strategy for my portfolio. This drill down by the top investment committee of Personal Capital does not obligate you to sign up for the paid service but gives you an idea of what to expect if you were to employ Personal Capital to manage all or part of your investment portfolio. Full financial and retirement plan. Guidance with all financial decisions including insurance, home financing, stock options and compensation. Customizable individual stocks, individual bonds (in certain circumstances) and ETFs. Estate, tax and legacy portfolio construction. Private equity and hedge fund review. Estate attorney and CPA collaboration. Let’s go through the Personal Investment Strategy so you can understand the company’s philosophy as well as what you can expect from the paid advisory service. 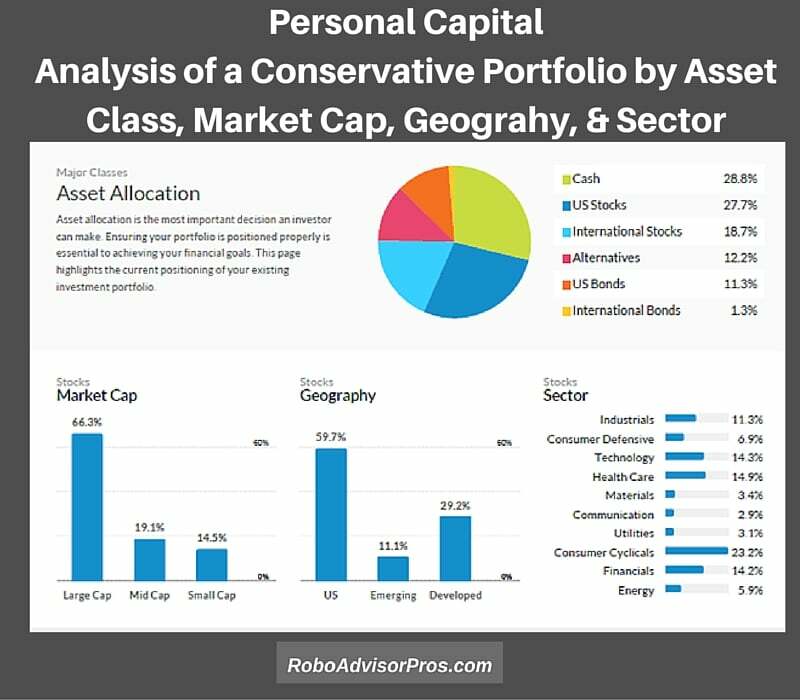 This screen shows asset allocation, diversification across market capitalization or size of the companies in my investment portfolio, geographical location of assets as well as the percentages in each sector. The advisor commented on this view of my asset allocation, sector, geography and market capitalization weightings. The following analysis of my current portfolio will give you an idea of the Personal Capital philosophy. The Personal Capital advisor recommended that the sectors be more evenly distributed. He didn’t like my existing portfolios over allocation to cash and he recommended adding alternative asset classes. Personal Capital believes in a tactical asset allocation which equal-weights all sectors. The back-testing of this strategy supposed an annualized 10-year return of 8.6% for an equal weight sector portfolio in comparison an annualized 10-year return of 7.7% for the S&P 500. Personal Capital recommended a riskier optimal asset allocation for me than the existing one which owns a conservative 40%+ in bonds and cash. Notice that Personal Capital recommends only 26% fixed assets; 25% bonds and 1% cash. That’s much more aggressive than I prefer-given my indication of a moderate risk tolerance. Although, the dedicated financial advisor would adhere to my preferred asset allocation. This is one way which Personal Capital differs from other robo-advisors. 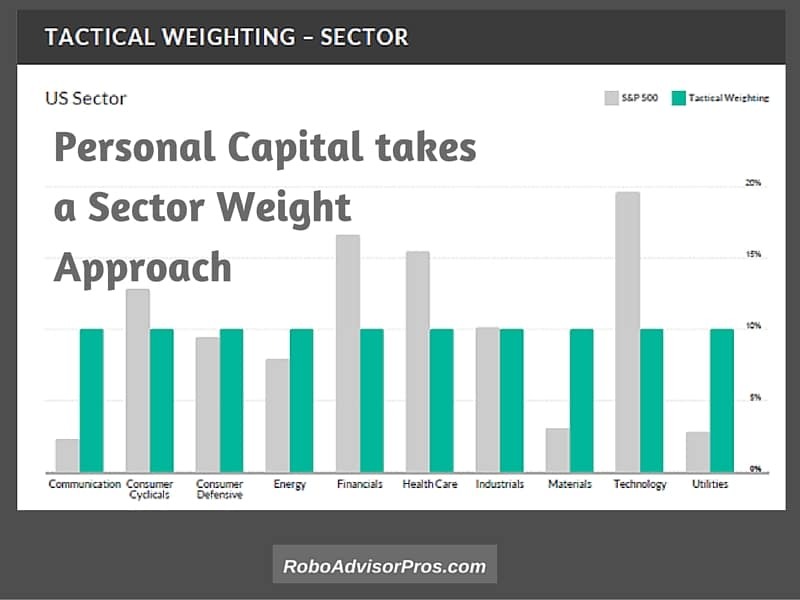 The company back-tested this theory and assumes that the Smart WeightingTM tactical equal sector weight portfolio will outperform the weighting in the S&P 500. Personal Capital explains that by limiting exposure to any one sector or style, you are better protected against losses in a down market. Personal Capital buys individual stocks on the client’s behalf for the U.S. stock portion of the portfolio. All other assets are populated with ETFs. This practice reduces ETF fees by eliminating stock funds. How Much Does it Cost to Use the Paid Version of Personal Capital? The fees paid to Personal Capital include advisory services as well as execution fees of securities transactions including any brokerage or third party management costs. Personal Capital is a Registered Investment Advisory firm and operates under a fiduciary standard which upholds the company to put your interests above their own. The sector weight allocation is an interesting approach to allocate investment assets. Personal Capital claims that this approach will protect investors from excessive portfolio risk and help returns. Their fees are competitive, when compared with other financial advisors. Actually, most financial advisors charge greater than 1.0% of AUM and often times up to 1.75%. The purchasing of individual stocks (and bonds) within the portfolio provides greater opportunities for tax loss harvesting which might lower your income taxes. My advisor listened well, confirmed my investing and retirement goals, prepared the Personalized Investment Strategy, all for no charge. He was helpful, not pushy or sales-oriented. All advisors are credential Certified Financial Planners. Personal capital offers tax, estate planning and sophisticated financial guidance. Their advisor board includes three of the top minds in investing today; Harry Markowitz, Sholomo Bnartzi and Luis Aguilar. You need $100,000 of investable assets to use the Personal Capital advisors paid advisory service. The platform is designed for the mass affluent client. The asset allocation recommendation for someone 10 years from retirement seemed aggressive with 26% allocated to bonds and cash and 74% in stock assets. I’m unsure of the research that supports the thesis that an equal sector weight portfolio outperforms the market capitalization weighting of the S&P 500. Additionally, there are flaws with back-testing a theory, as it doesn’t guarantee that the results will play out accordingly in the future. 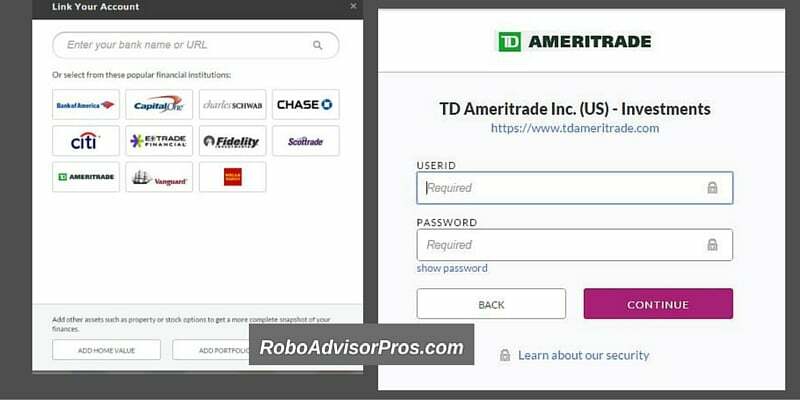 There are other robo-advisors, with access to personal financial advisors with lower fees. Wealthsimple charges .40 to .50%, Betterment Premium charges o.40% and includes financial advisor access. Vanguard Personal Advisors requires a $50,000 minimum investment, offers advisors and charges a 0.30% AUM fee. 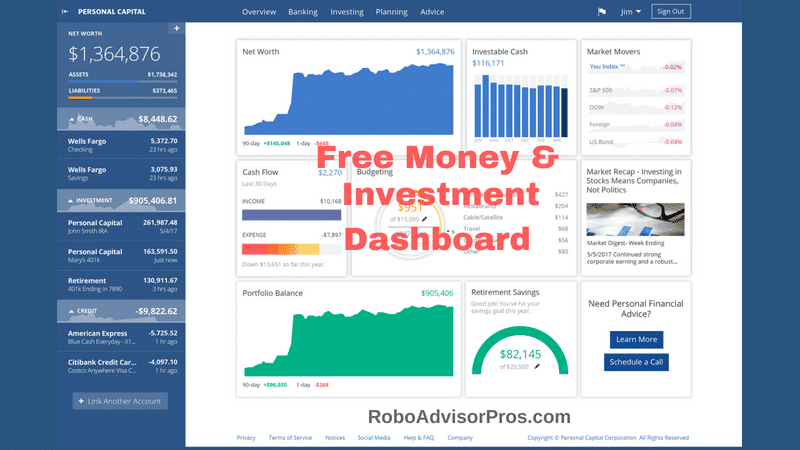 There’s no doubt that the free Personal Capital dashboard, cash flow, retirement planner, investment checkup and investment analyses are invaluable tools for the consumer. For the investor looking for a financial planner, the fees are reasonable and the services exceptional. There are no future return guarantees for any investment approach and only time will tell if Personal Capital’s tactical asset allocation plan beats a more conventional market-weighted investment approach. In fact, no robo-advisors have proven their worth during a down market. We recommend signing up for the free service, speaking with the investment advisor and deciding whether the paid service fits in with your personal investing needs.